The Ringed City offers one final hurrah for Dark Souls 3. The most stunning moment involves a surprising boss fight with a creative twist. Dark Souls 3's last piece of DLC is remarkably strong. Environments rip and tear previous games to cobble together a beautiful world, involved quest lines weave fascinating tales, and exciting boss fights provide a satisfying challenge. The second boss fight is not just the best of the DLC, it is the most intelligent encounter in the series. 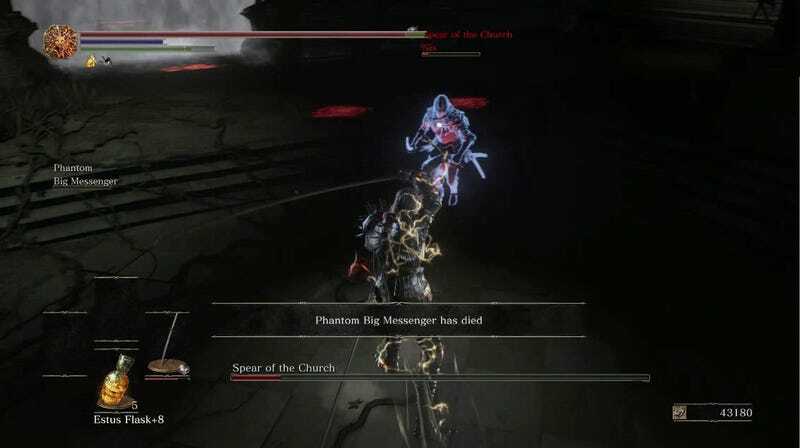 After defeating the Demon Prince, players make their way into the Ringed City. It is a beautiful setting that weaves together the design of Dark Souls kingdoms past like Anor Londo and Drangleic. The Ringed City is where Gywn’s youngest daughter resides, guarded by a fell dragon and loyal servants called Spears of the Church. A major focal point in the level design is a lone church at the bottom of a valley. You can see where this is going. 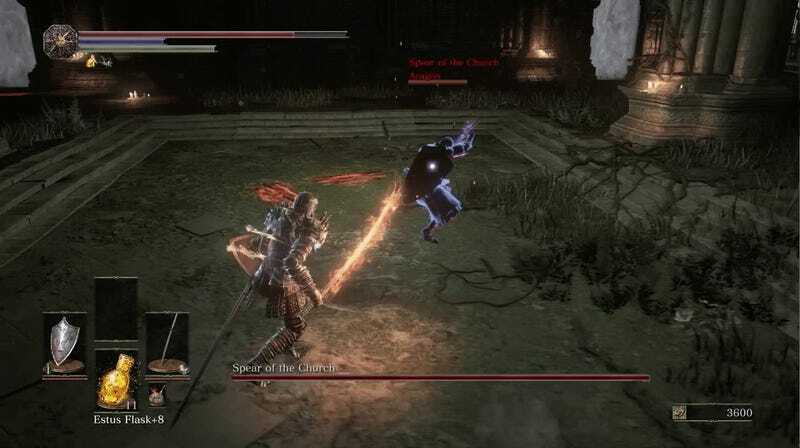 The church in the valley houses the next boss and it seems likely that you will have to fight a servant of Filianore, the aforementioned daughter of Gywn. Outside, a stone slab that asks for offerings similar to the spots where other covenants can offer items for rewards. There’s no doubt what lies ahead. The stage is set as you enter the church. A towering giant, Judicator Argo, laments you foolishness and calls forth a loyal warrior to punish your transgression. He calls forth what appears to be one of the painting guardians from Dark Souls, a relic of the past ripped right out of the first game to battle you here. Then, he summons another fighter. The Spear of the Church. They’re deadly. Magical energy protects them. The AI is amazing; it feels like fighting another player. Something feels wrong. Something is wrong. The first time I tested my mettle in this fight, the Judicator summoned a spirit named Aragon. They were a dangerous knight, using sword techniques that tossed magical gouts of fire across the ground and unleashed a wild flurry of sword attacks unlike any I’d ever seen. Alongside the painting guardian, they tore me to pieces. This was going to be hard. Curious to learn more about the fight’s mechanics, I left my summon sign on the ground. I wanted to know how the fight progressed. Helping another player would allow me to analyze the battle before tackling it myself. It also meant doing a good deed and earning an Ember that would grant me extra health. The message displayed. I was summoned. As a Spear of the Church. 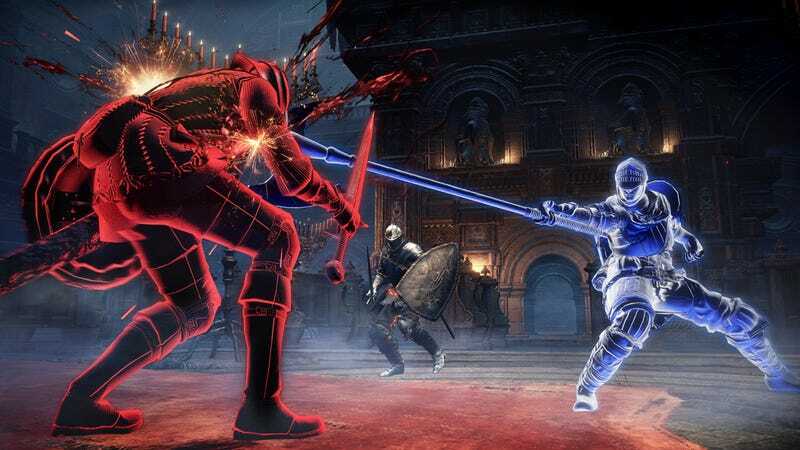 Player versus player combat is one of the pillars that supports Dark Souls. Invading other worlds to slay hapless undead or engaging in arena duels have been core features since the beginning. Demon’s Souls pulled a similar trick with considerably less fanfare. 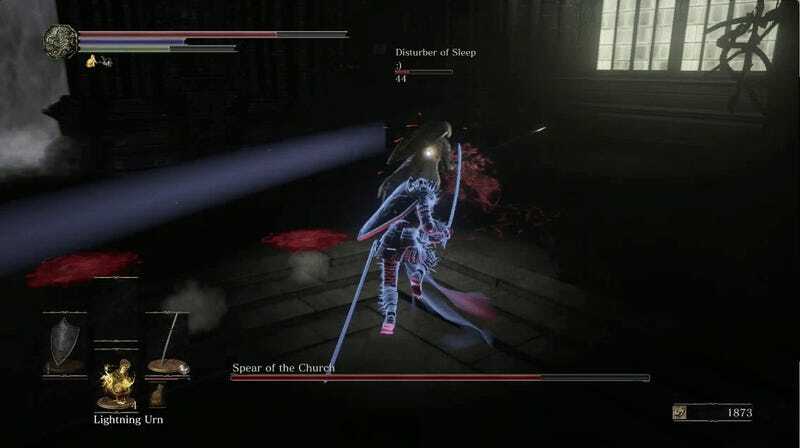 One of Dark Souls 2's most iconic moments has invading players summoned during the Looking Glass Knight boss fight. This felt different; Dark Souls 3's metatextual remixing on previous games’ elements added an additional edge. This was a ritual, a super charged repetition of a key series moment. I was not a minion. I hadn’t planned to invade. But here I was. I was the boss. I was this player’s executioner. So I killed them. I could have done nothing. I could have thrown the fight and allowed them to proceed. I didn’t. I cut them down. It was my duty. This battle proved the largest hurdle to my progress in the DLC. I was considerably under-leveled for the content and while I enjoy casual PvP sessions, many of the fighters that were summoned were clearly setting up shop at this spot to prey on unsuspecting players. Just as I killed, other players killed me. Again and again and again. Eventually, I called for aid. Flanked by my own summoned companion, I faced off against an invader named Nix. His onikiri and ubadachi blades allowed him to do a dangerous leaping attack but this also meant he was more predictable. As my compatriot fell to the painting guardian, I chased Nix down and reduced his health to a small fraction. I was so close. My heart pounded furiously. Nix turned and leapt at me. If he connected and followed up with a combo, I’d be left scrambling against two enemies. If I took too long, a third might be summoned. I faced down my foe and slashed. The trade worked; he hit me but it cost him the fight. It wasn’t a graceful end but I had triumphed. There had been plenty of great boss fights in the series: Artorias, Darklurker, the Nameless King. I’ve faced plenty of challenges. Nothing compared to the challenge of fighting my fellow undead for one last fight.